This work was produced for the First Christian Church of Mound City, Missouri. The memorial window committee wanted a crucifixion scene done simply with colors that would compliment the existing windows and church interior. The deep red and navy blue at the top of this window was requested to compliment the existing windows. Each new window will have the red and blue and an appropriate Christian symbol in the center triangle. This is the first of twelve scenes for this church. I had artistic freedom to design whatever I imagined — a dream come true. Creating my own pattern for this window was a long but enjoyable process. I truly enjoy the designing portion of each project and rarely use stock patterns. I had many rough drafts before I was satisfied with my rendition of this awesome event. I did not import any photos or layouts from other sources. I had an image in my mind of how I wanted it to look. I simply began to "sketch" with the mouse. The beauty of using Glass Eye 2000 is that I was able to constantly revise my lines with simple mouse movements. The "Undo" feature came in very handy when I would make a change that I thought would improve the scene but, in fact, did the opposite. The timeless method of drawing on paper is always useful for early sketches and might have saved me some time, but I chose to draw this pattern entirely inside the program. Who could blame me when it is so much fun? The glass library is the next best feature. With this pattern I used the numeric values that are shown for each color. I was able to compare different shades of green, for example, and see just how bright each piece was because the values are listed for hue, saturation, and luminosity. I chose a range that I wanted to stay in for the lower two sections of the window and then chose colors that had similar saturation and luminosity levels. This way I was sure that the whole window would be composed and balanced. I love being able to scroll through all the glorious colors and click in exactly what I want for each pattern. What a time saver! 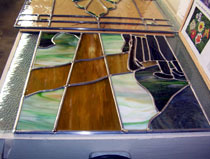 My clients can see a good representation of their window before any glass has been bought or cut. Much of my glass is ordered in wholesale, so if it's a large amount I will find an actual sample to compare on my light table before I purchase. I don't own all of the glass maker's sample boxes so a trip to a glass retailer is the next step. There I can find all those small pieces and sometimes some unique glass that I might never have thought to use. For instance, I had a more opaque glass in mind for the rocks in this scene but when I came upon some rippled Chicago Art Glass I just had to have it. It was more than I wanted to spend but I believe that if you find the right piece for a composition and it's better than any you've seen you should buy it. Don't pass it up just because it costs more. The quality and composition of the piece is more important than the profit margin. 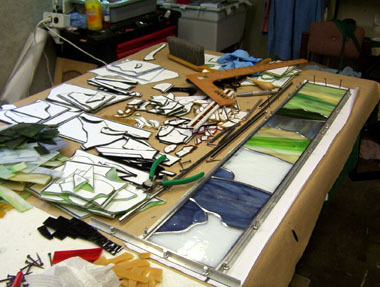 Finding the right glass for each project is like a treasure hunt! This is my first church commission. I contracted with a local cabinet maker to build the oak frames and exterior storm windows. They are made in such a way that I am creating nine separate panels for each frame. This method uses more framing lead than a traditional window but also allows for easy access for repairs if they are ever needed. The size of the panels make them more manageable for a one-person shop to complete and ship if necessary. 98% of this was cut by hand. I used my Diamond Tech band saw to cut a few of the deep curves. Cindy's company, Celestial Stained Glass Design, was formed in 2003 as a custom design service that used Glass Eye 2000 to facilitate the creative process. 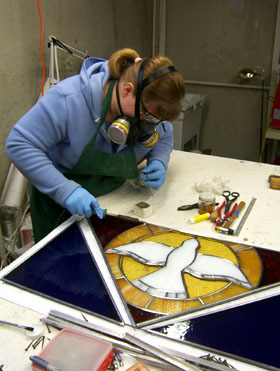 She took her first stained glass class at the Lawrence Arts center in 1998. 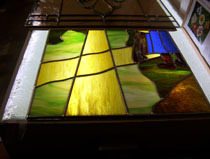 Soon after she began working with David Clark of Redfield's Stained Glass & Beveling in Lawrence, Kansas who became her mentor and tutor for many projects. In 2004 she attended the Glass Eye 2000 course taught by Joseph 2Bears at Glass Craft Expo. In 2006, she attended Pilchuck Glass School in Stanwood, Washington. Cindy Stewart Grant is a member of ARLIS NA/CP and now manages a public library and enjoys glass as a hobby. You may contact Cindy by email. Download "One Life Won Love"